Last Wednesday morning, I ate a bag of fruit snacks for breakfast. Not as a post-breakfast dessert, but as the breakfast main course. In my defense, they were Annie's Organic Bunnies (the berry flavor 'cause you know you were wondering). In between doling out spoonfuls of oatmeal to the babies and frantically blow drying my hair to look a bit less like a bird's nest, I actually think it lucky I ate at all. Needless to say, we're still trying to perfect our weekday morning routine where everyone leaves the house on time and with a belly full of real food. Oh, and wearing matching socks because heck, we have high standards 'round here. But weekends? Weekends are when my breakfast game shines (and there are no fruit snacks in sight). I love me a great weekend breakfast so much, I actually start talking it up from Thursday night. I generally lead with asking Little Man, "Who wants Donald Duck pancakes this weekend?" And lest you think that our pancake batter skills are awesome, you should know that Donald Duck pancakes refers to a Donald Duck cartoon where he makes a billion, you guessed it, pancakes. Besides pancakes, the weekend breakfast always includes some form of potatoes. So when I saw that this month's Blogger CLUE theme was potatoes, I was stoked. Almost as stoked as if the theme were fruit snacks. I kid. Sort of. I hopped on over to my blog buddy Kelli's blog and started my search for the perfect potato recipe. If you're not familiar with Kelli's Kitchen, I definitely recommend you check it out. Kelli shares down-home recipes and is an expert at canning, a skill she learned from her nana. Having canned a grand total of once, I'm always in awe of folks who are able to regularly stock their pantries with delicious home-canned goods. In my search, I found Kelli's Potatoes O'Brien recipe. We're generally pretty loyal to the Crispy Roasted Potatoes from Serious Eats but I was intrigued by this O'Brien business. Could I fuse our favorite roasted potatoes with some charred peppers and onions and make them even better? Yup, I went there. And it was awesome. The grilled peppers and onions really brought the humble roasted potato to the next level. Unsurprisingly, the babies made us pick all non-potato items from the dishes but that only meant more delicious onions and peppers in our potatoes so the Hubster and I were actually down with their pickiness for once. As far as recipes go, you can definitely tweak this based on your starvation level. Kelli uses a bag of southern hash browns (what are these and how can I get some)?! I didn't have any frozen potatoes so I peeled and roasted up some regular ol' Russet potatoes. Feel free to mess around with the recipe as long as you follow the basic formula of potatoes + peppers + onions + fat = good. For the roasted potatoes recipe, please see Serious Eats. While the potatoes are roasting, heat 2 tablespoons of oil in a skillet until the oil is shimmering. Raise heat to high, add the peppers and onions and cook undisturbed until the peppers and onions are charred on side. Stir and cook the peppers and onions until soft. Seasons with garlic powder, salt and pepper. Add the roasted potatoes to the same pan and mix well. Eat straight from the pan right away. Want more Blogger CLUE? You got it! Oh, gosh, you made me giggle with your morning routine!!! I remember those days :) These yummy potatoes O'Brien are perfect for the weekend---and I know my hubby would love them with his evening meal, too! 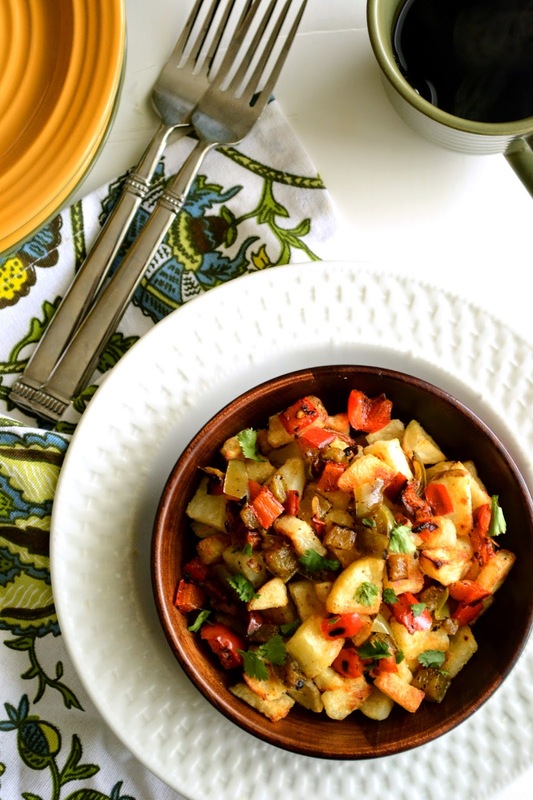 Potatoes + peppers + onions + fat = not just good, but awesome! I like the way your mind works, Azmina and I love those colorful potatoes! They'd be a favorite at our place too. haha - I love Donald Duck pancake weekends! I'll have to use that. ; ) Weekend breakfasts really are the best (and better as the kids get older and there's more and more time)! When we're having a savory breakfast, I like to make a side of potatoes sometimes. This looks totally fabulous! What a beautiful dish! You did a great job and I do love the frozen hashbrowns to make this very old recipe with because more of the potatoes get really crispy - which we love..........except now, we have a grandson and he doesn't like crispy - nor does he like the peppers so I generally make them with regular potatoes so there can be the soft part he likes and I too pick out the peppers if his mom and dad don't first! :) Thanks for doing such a great job - I really appreciate it! Potatoes O'Brian.....can't get much more Irish than that!! Happy St. Pat's day and top o the mornin to ya. 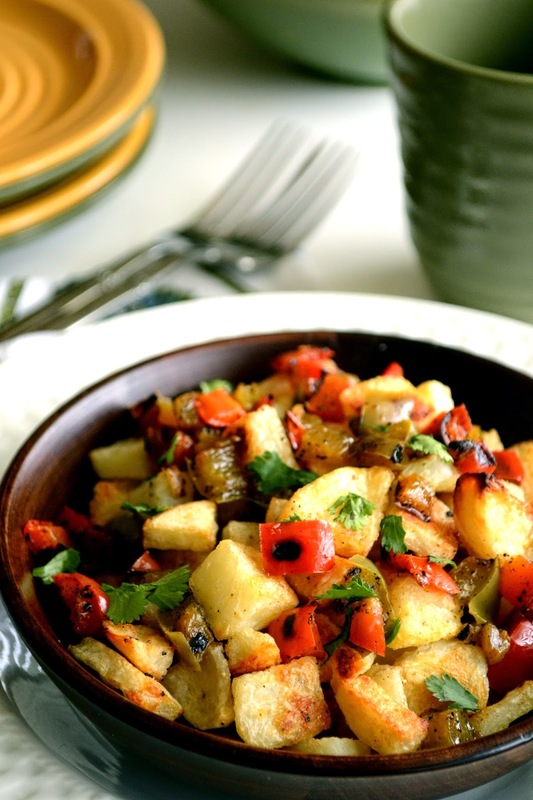 Beautifully browned potatoes....a weekend breakfast with such a colorful bowl of potatoes....I have my fork handy! I agree about those weekends and breakfasts. And your photos are really nice. Great choice. I really need a better breakfast game, even on the weekend we usually skip. These look terrific, and I love the touch of color they have with the veggies! Great choice and perfect for breakfast. I'll have to try this for brunch or brinner sometime soon. I'm not big on potatoes for breakfast, but a bowl of these with some pancakes?? And eggs?? Sounds like a plan to me! One of my favorite potato recipes! And, I do love reading your blog. I laughed out loud! Ok... I had to laugh out loud at the fruit snacks for breakfast. I can so identify!! Or at least I used to be able to. Breakfast is much more civilized when they are teens. It's very quiet as the teens tend to be grumpy and non-vocal in any way, but at least there is time for food! Potatoes O'Brien are one of the most requested breakfast foods in my house! Yours look seriously amazing, and I'm about ready to break out the potatoes right this minute. Perfect choice for this month. I'm totally with you on breakfast. In fact, if given the choice of eating out for dinner or breakfast, I'll choose breakfast every time. Only difference is that I prefer eggs and bacon to pancakes. Potatoes are a must though...crispy on the outside, tender on the inside. Peppers and onions added sounds fantastic. I m single and no babies yeti struggle to leave house on time with a full belly..so with some oatmeal and fruit snack, you are doing good :) these potatoes look great, a total weekend affair. You make this O'Brian business look so darn good! Now I am wanting never ending pancakes and potatoes for dinner! Your morning routine sounds like my weekday lunch routine - it got so tiresome, I just graze all day! I have never had Potatoes O’brian…but after seeing yours, I need to make them! A great choice! Lol, I usually eat pretty poor "breakfasts" during the week (I sleep right until the last possible minute and then haul @ss to the office) but like you, I LOVE making leisurely breakfasts on the weekend. This looks fabulous! And I adore Kelli - she's such an amazing, hilarious, feisty lady.